Well, it’s said that there are no new ideas in gardening, and this pruning technique, at least, was anything but new. Long known as “coppicing”, the technique has been used for centuries as a form of woodland management, and to promote the production of abundant, slender, straight regrowth that could be harvested regularly for firewood, fencing, and other uses. Cutting-back also comes up when you learn about rejuvenation pruning, as a way of reclaiming overgrown deciduous shrubs. 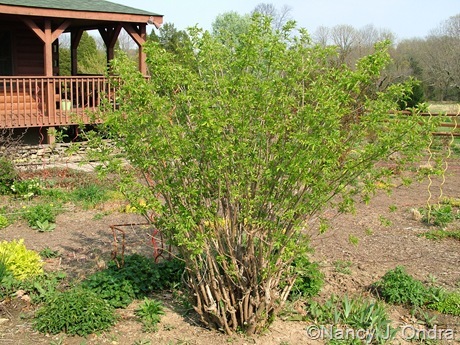 Not all them can recover from a drastic whacking, but if they’re otherwise healthy, cutting them back severely offers pretty good odds that they’ll resprout into a much fuller, better-looking shrub. 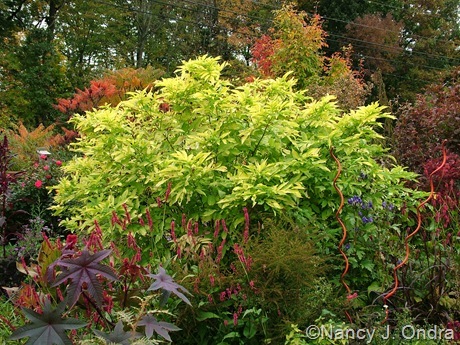 What was new about the concept of cut-back shrubs – to me, at least – was the idea of using hard pruning to create ornamental effects, rather than as a practical production or management technique. And while I’ve pretty much moved on from the hooray-for-mixed-borders mindset, having found that herbaceous borders are actually a whole lot less complicated to maintain, puttering in the garden this spring has made me realize that I still grow quite a few of the cut-back shrubs that I found so exciting back then. If you too are a fan of colored foliage, you’ll appreciate the value of a maintenance technique that can produce bigger, brighter leaves. One of the best shrubs I’ve found for this is black elderberry (Sambucus nigra) – in particular, the relatively ordinary, yellow-leaved ‘Aurea’. This golden elderberry clump in the front garden gets cut back hard at least once every spring. 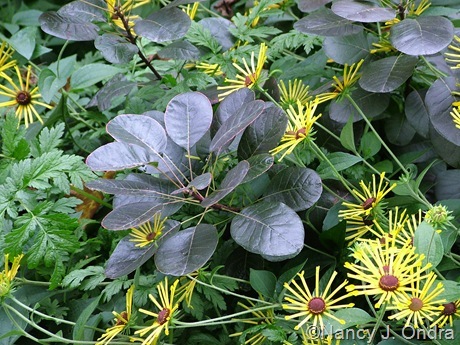 From a framework about 1 foot tall, it grows back to form a mound about 6 feet tall and wide, with broad, bright yellow leaflets that hold their color for months. It’s shown above in mid- to late July and at the very top of this post in mid-October. One spring, I didn’t cut it back, and about a dozen of the long outer shoots sprawled and took root. The following spring, I moved the rooted layers to a transition area between the meadow and the garden. I cut these back only every three years or so, and they get 8 to 10 feet tall and wide. They stay bright into summer (they’re shown above in mid-July), but after that, the unpruned clumps look either bleached or greenish and are hardly noticeable. Coppicing for foliage works on red elderberry (S. racemosa), though I had mixed results with it on ‘Sutherland Gold’. In my old garden, I let it be a small tree, and it was lovely and lacy, even if mostly green after the first flush of fresh yellow leaves. I rooted two cuttings when I moved and decided to treat them as cut-back shrubs here, because I wanted to keep them in narrow spots. This one was in 4-foot-wide border out front (shown below in mid-June). Unfortunately, both of them got weaker after each cut-back, and I lost the one out front after five years. I tried giving the other one a higher framework (about 2 feet), and even let it get a taller permanent trunk, but it lived only another two years. It’s normally a beautiful shrub and I’d love to get another one, but if I do, I’ll keep my loppers off of it. 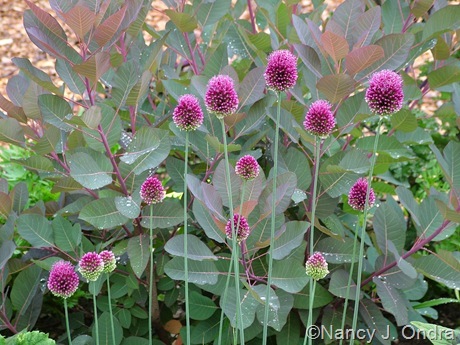 Smoke tree or smoke bush (Cotinus) is another woody plant that responds well to pruning for foliage interest. You give up the puffy flowers, but that’s a fair trade-off for the value of having the colorful leaves much closer to the ground. (Left unpruned, these shrubs or small trees reach the 15-foot range, with color mostly at the top.) I cut the deep purple ones – those sold as ‘Royal Purple’ or ‘Velvet Cloak’ – back to about 1 foot each spring, and that allows for some nice mingling with lower annuals and perennials from late spring through midsummer. Later in the season, the shoots get quite tall (typically 8 to 10 feet), with the best color along the upper half of the stems. You lose the lower color combos, but the tall shoots still make a nice backdrop for tall fall bloomers. Hybrid ‘Grace’ has also responded well to coppicing. 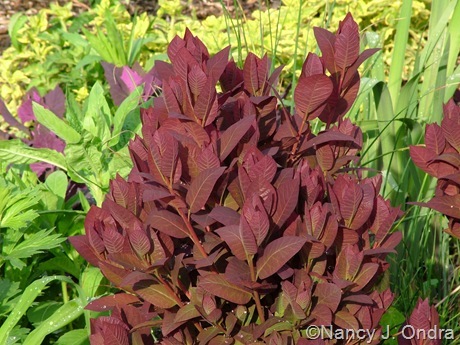 The new growth is a rich red to reddish purple, depending on the lighting. The color is less intense but still reddish to pinkish purple going into midsummer. By late summer, the good color is mostly out at the shoot tips. 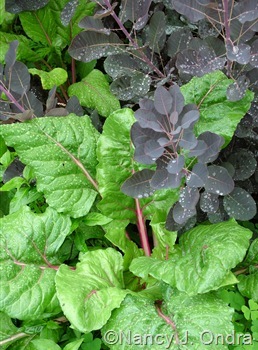 Below is the same plant at the same time – mid-August – in 2008 and in 2010, showing the variation in the color it can have, depending on the weather conditions. 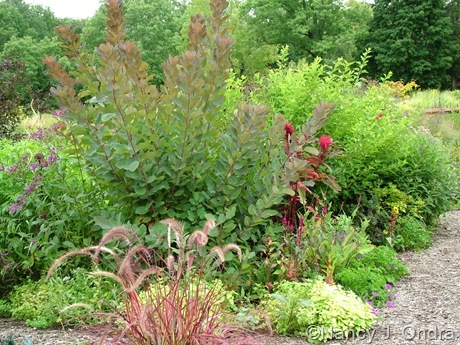 But then you get the brilliant red fall color, so there’s still a benefit to having lots of bushy growth. 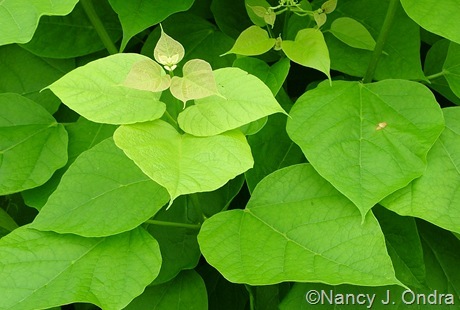 Golden catalpa (Catalpa bignonioides ‘Aurea’) is yet another candidate for the cutting-back technique, forming broad mounds of brilliant yellow to bright greenish yellow, heart-shaped leaves. 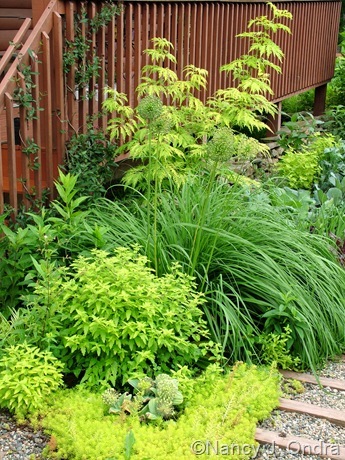 The garden effect is something like that of the golden elderberry but much bolder, because the leaves are entire and much larger. 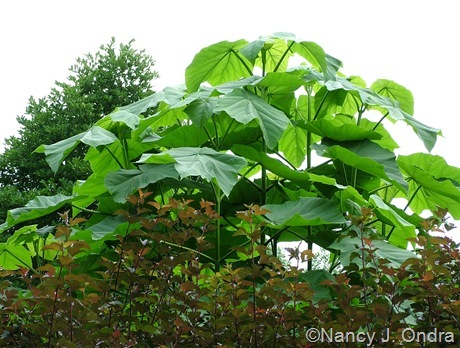 Be warned, though: Keeping a golden catalpa (which wants to be in the 40-foot range) to border scale (6 to 8 feet tall and wide) isn’t a project you want to take on without serious thought. 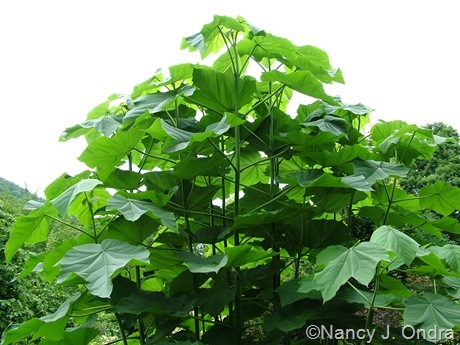 The same goes for princess tree (Paulownia tomentosa) – it too wants to be a big tree, and even with yearly coppicing, it can reach 15 feet or more, with gigantic, broad leaves. Dappled willow (Salix integra ‘Hakuro nishiki’) isn’t nearly as vigorous as either golden catalpa or princess tree, but it can still get way too big for a home-scale border without severe pruning. 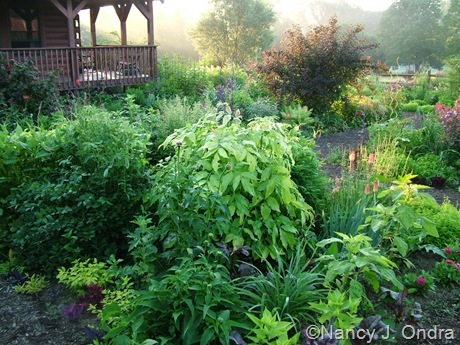 I cut mine back to 6 to 12 inches every spring, and it fills out to about 8 feet tall and wide by the end of the growing season. Below is what it looks like in late May, about a month after coppicing. A landscaper planted several of these at a neighbor’s place the same year. They never get pruned and are now about 12 feet tall and wide, with a rather ugly, rangy form. They also don’t provide a great show of this plant’s best feature: its brightly variegated new growth. Unpruned dappled willow shows this mostly at the short shoot tips, and it seems to turn mainly green very quickly. 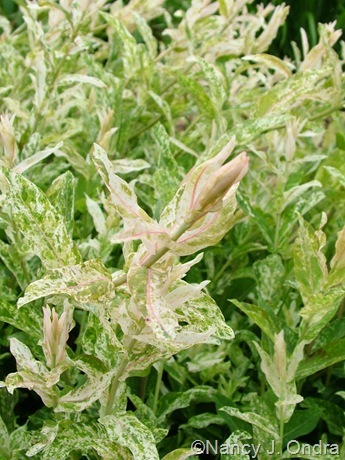 On the pruned plants, the variegation stays bright through the summer and is still noticeable in fall. 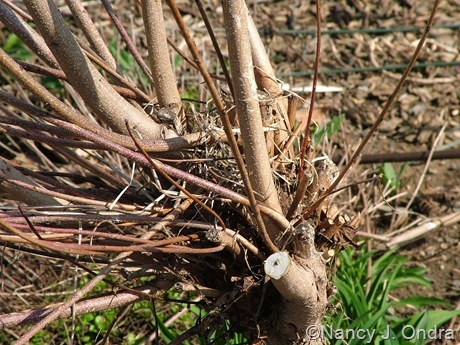 Regular coppicing isn’t a pruning technique you’d use on most forsythias, because spring pruning removes the flower-bud-bearing stems, and you’d never get blooms. (Well, I suppose you could coppice immediately after the main bloom period, but I find it easiest to do all of my cutting-back at one time, so I’ve never tried it myself.) 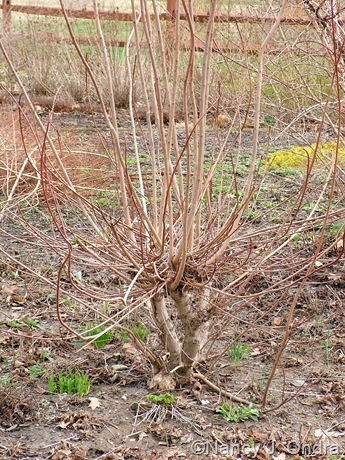 With ‘Kumson’ (Forsythia viridissima var. koreana), the flowers are nice but not nearly as interesting as the foliage. I have a few out in the shrubbery that I let grow as they wish. 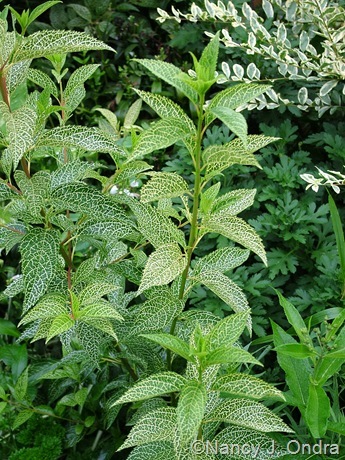 The summer foliage is still variegated, but it’s not nearly as bright or long-lasting as it is on new shoots. 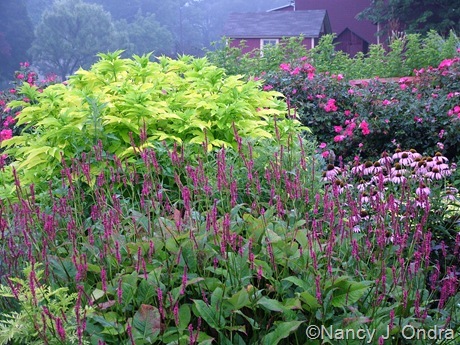 I like to keep one piece as a foliage accent in a border, though, so I cut this clump back to about 6 inches each spring and enjoy the brilliant markings all through the growing season. 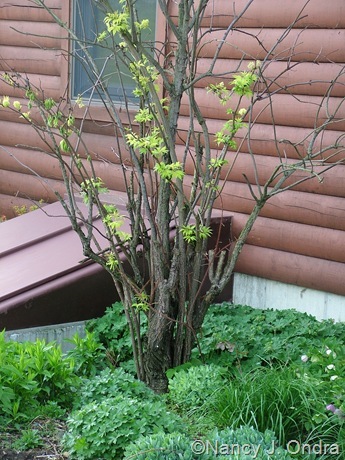 On deciduous shrubs that bloom on “new” wood (the stems produced during the current season), coppicing can produce larger flowers. Freakishly large flowers generally don’t do much for me, but I’ve gotten rather fond of the big white blobs of smooth hydrangea (Hydrangea arborescens) over the past few years. They weren’t my original goal when I started cutting back this row – I was mainly trying to control their size and shape – but since the regular spring pruning also led to the larger bloom clusters, it was just as well that I got used to them. The trouble is, the larger the clusters, the more likely it is that the slender stems won’t be able to support their weight. Unless a dry summer keeps the shoots relatively short and sturdy, there’s a better-than-even chance that the blooms will end up sprawling at some point. Mine are planted only 3 feet apart, so they pretty much support each other, and there’s a fence along one side that helps too. When they keel over into the path, I cut them and stick them into watering cans and appreciate them as cut flowers. 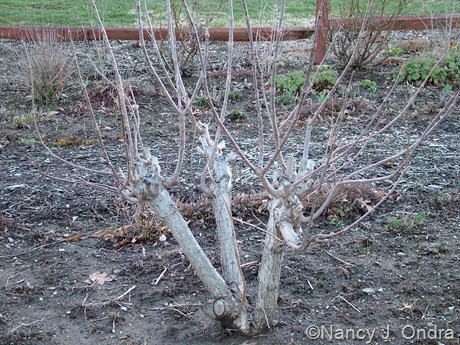 These too have the potential to sprawl after hard spring pruning, but their regrowth seems to be sturdier than that of the arborescens types and better able to support the weight of the extra-large clusters, especially if you cut them a little higher – to a 12- to 18-inch framework – instead of right at or close to ground level. 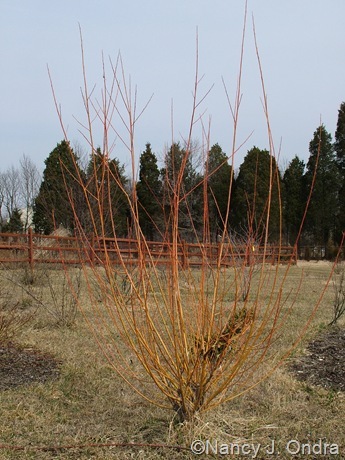 Hard pruning also works beautifully on shrubs grown mostly for their colorful stems, because the young shoots also have the brightest bark. 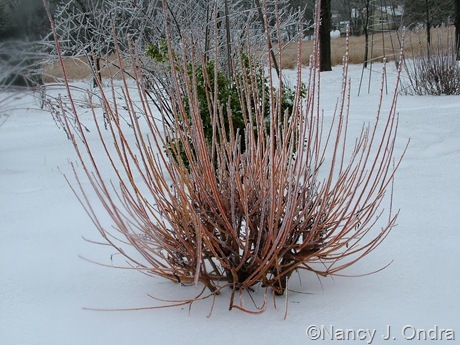 Shrubby dogwoods, such as Cornus sanguinea and C. sericea [C. stolonifera], are some of the best-known examples. ‘Budd’s Yellow’ has been vigorous enough here to tolerate coppicing every year. Variegated ‘Silver and Gold’ tends to stay more compact, so I cut it back only every other year. 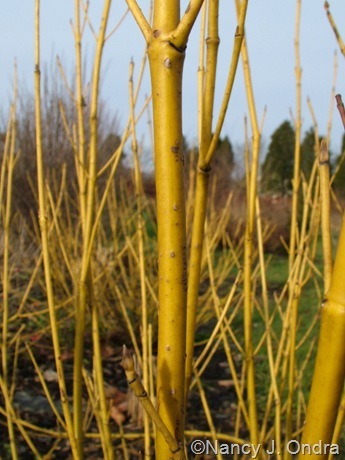 ‘Sunshine’, with bright yellow foliage, has been the least vigorous of the three, so I coppice it only every third year, and to about 1 foot instead of 6 inches. But now that it’s really settled in, I cut it to about 1 foot each spring. I like ghost bramble (Rubus thibetanus ‘Silver Fern’) mostly for its foliage, but the white-coated first-year stems are interesting too, if a bit wild-looking. I’ll add here that, as pretty as it is, ghost bramble is not a smart choice for planting close to a path. 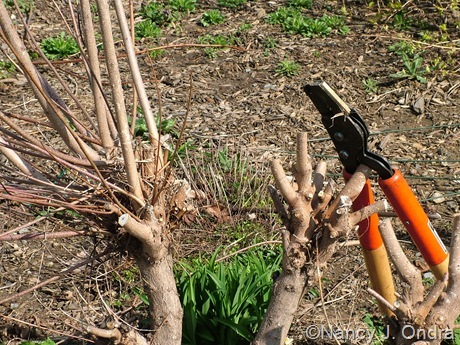 If you try to tip back the too-long shoots, it detracts from their graceful arching habit, but trying to cut them off at the base is a perilous prospect, even with long-handled loppers. 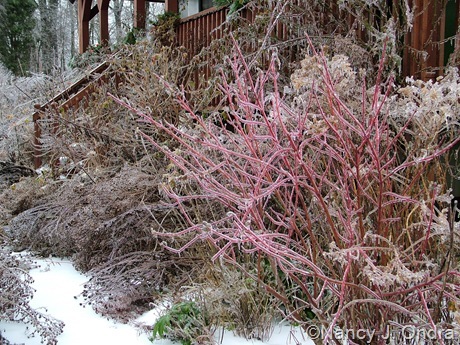 Pruning for size control isn’t directly related to creating ornamental effects, but it is an issue if you’re trying to keep foliage or flowering shrubs in the right scale as part of a mixed planting. Ninebarks (Physocarpus opulifolius), for instance, offer some outstanding ornamental features (especially in the form of purple or yellow foliage), but the cute little starter plants that many nurseries sell can get way bigger than you’d imagine after a few years. They don’t seem to take kindly to a complete cut-back every year, but once they’ve been allowed to grow in place for several years, coppicing every second or third spring can be a good compromise. The plant will send up lots of dense, leafy, upright growth the first year. …and produce the even-better red seedheads a few weeks later (below on Diabolo, at the back, and then on ‘Dart’s Gold’). 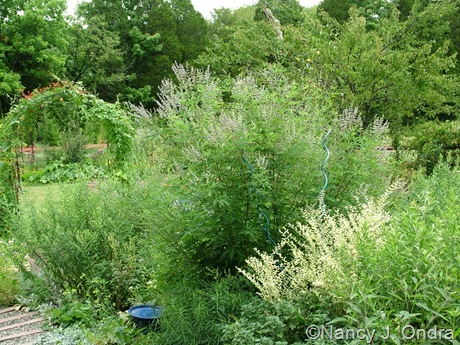 I don’t have much luck with butterfly bushes (Buddelia), but I do grow chastetree (Vitex negundo), and cutting-back works well for keeping both of these summer-blooming shrubs in reasonable dimensions for a medium-sized border. If you’re thinking of trying coppicing in your own garden, I strongly suggest giving newly planted shrubs at least two growing seasons before you start cutting them back hard. Three or four years would be even better, unless you feel sure that they’re well settled in and growing vigorously. Consider cutting every second or third year for a time or two, then go to every year if a particular shrub seems strong enough to handle that. If you have established shrubs that you’d like to experiment on, try pruning to maybe 18 to 24 inches at first, then try out different heights and/or time intervals depending on how they respond. …then cut it back to about 1 foot in mid-May. I let it shoot up again, then cut it back to 2 to 3 feet about a month later (early to mid-June). On the down side, the cut-back plant looks rather ugly much of the time until about midsummer, which would be unfortunate if I planned my borders for spring and early summer. 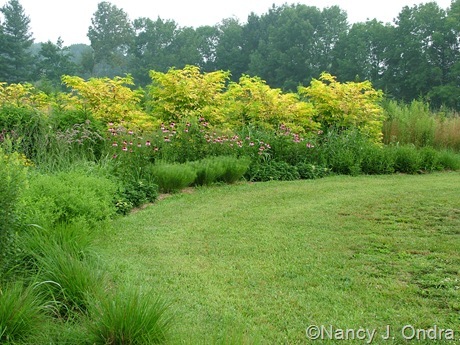 But since I like having them peak in late summer and fall, the two-cut approach has been a great way to get a real jolt of bright color and fresh-looking foliage while keeping the elderberry about the right size. 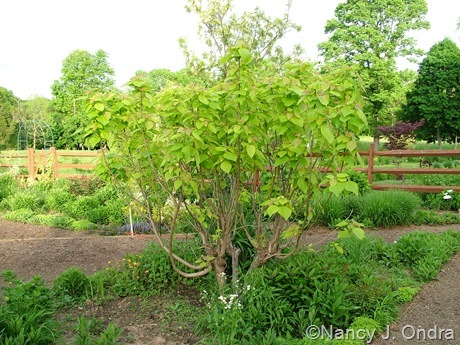 I treat the catalpa in a similar way, but it’s on a three-stem framework that’s about 18 inches tall. 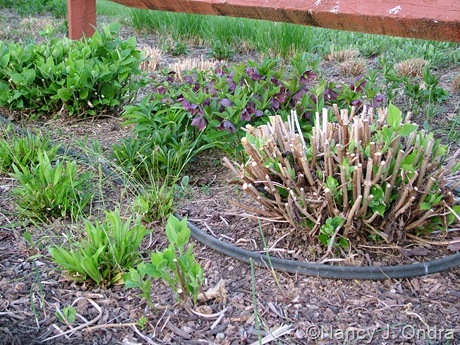 …I break or prune off half to two-thirds of the new shoots. And if the clump got really large the previous year, I cut the remaining shoots back yet again, to about 1 foot above the framework. As with the golden elderberry, all this pruning makes the golden catalpa kind of ugly until about late July, but then it’s lovely for late summer and fall. One more tip I can share relates to keeping a higher framework for the coppicing, as I do on the catalpa, and on ‘Grace’ smoke bush too. It looks rather bizarre during the off season, but it lets you plant closer to the base of the shrub. 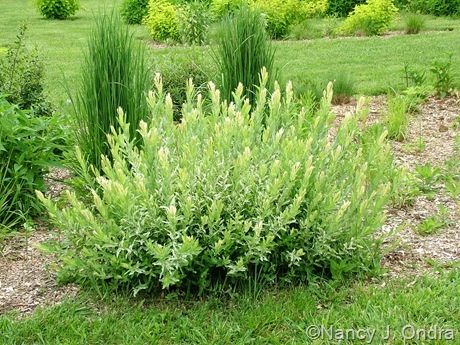 I’ve had the best luck with either early bloomers, such as hellebores, or tall fall bloomers, such as burnets (Sanguisorba), ironweeds (Vernonia), and sneezeweeds (Helenium), which can grow up through the outer branches of the shrub and use them for support. …to get a clean framework. …and the same shrub three weeks later. Well, gee, this post got way longer than I expected, and I hope I haven’t made it all more complicated than it really is. 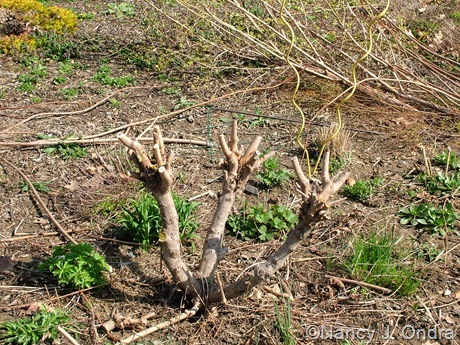 Coppicing may not be a comfortable technique to use if you’re timid about pruning, but if you’re not afraid to do some serious lopping and you have some shrubs to experiment on, give it a try and see what you think! What a wonderful well written post! I too am prone to keep things fresh and smallish so I can have more in my beds. You grow a couple things I might try too, nice to see the combinations. Wonderful visit to your lovely garden. Thanks, Brooke. Sometimes I wonder if it’s worth putting time into trying to keep these shrubs small (or “smallish,” as you said, “small” being relative with shrubs) when they want to be big, but having that fresh foliage for late summer and fall makes it worth it, most of the time. Fascinating! I’ve just begun experimenting in year four here. 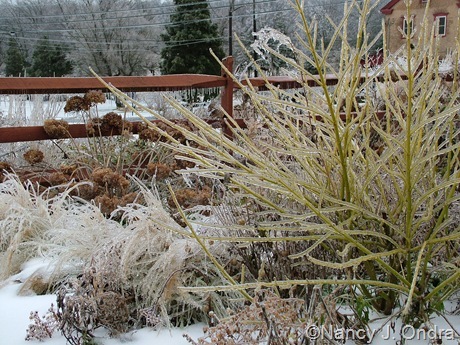 My problem is the perennials outpace the shrubs, so the shrubs get shaded out. 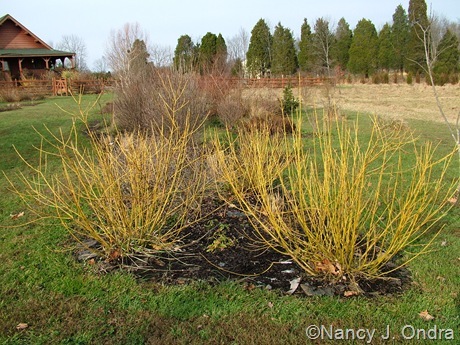 One side of a yellow dogwood is dead–the side that got least sun least year. And I’m so sorry to hear about your ‘Sutherland Gold’ elderberry on the north side! I remember years ago a post on it, which made me call a dozen area nurseries until I found one. We should hold a wake or something for your elderberry. That’s okay, Benjamin, I’ve accepted the loss and moved on. Too many other plants to try to mourn for long. 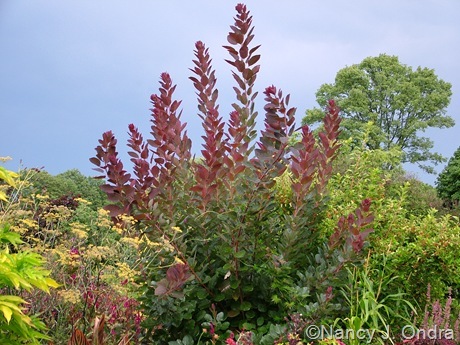 Your experience of the challenges of growing shrubs with perennials matches mine, which is why I’m finding it much simpler to go to all-herbaceous in some areas. 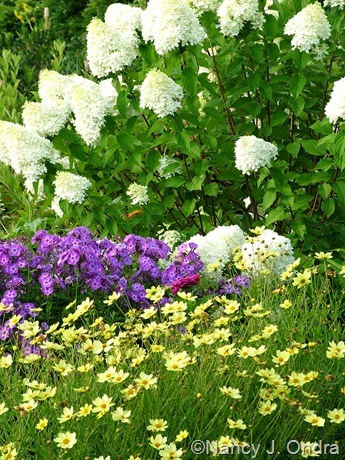 Unless you can start with good-sized shrubs, you have to keep them from getting smothered for a few years; then you get a season or two of balance before having to keep them from smothering the perennials. 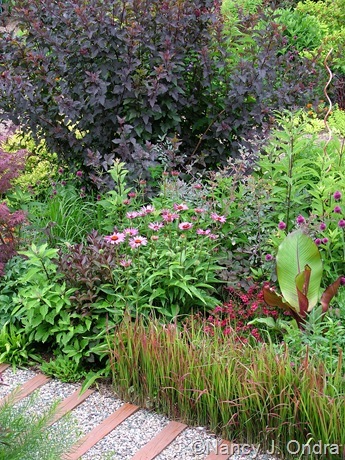 It’s an interesting challenge in limited areas, but trying to keep up with it in a larger garden can be overwhelming. This is very timely and great information. I was out cutting several spirea back to nearly the ground to rejuvenate them a bit. Thank you! Oh yes, spirea is another great example, Carol. I have a bunch of different yellow ones that don’t get too big anyway, but a good cut-back every few years does help to keep them looking good. Sometimes I cut them back in fall instead of spring to reduce self-sowing, since I’m starting to get a number of unwanted seedlings from some of them. Beware! I found S. alba var. vitinella ‘Britzensis’ to be a runner, sending up shoots all over. Thanks for sharing that, Ilene. I hadn’t seen that mentioned anywhere, and I haven’t seen any signs of suckering on my own plant, which has been in place for almost 10 years now. I’d actually like to have a lot more of it, so I stuck a few dozen of this spring’s trimmings as cuttings. Nan, this is a technique that I was used to seeing on the farm as coppicing so it was obvious to use in my first garden, on a variegated poplar. 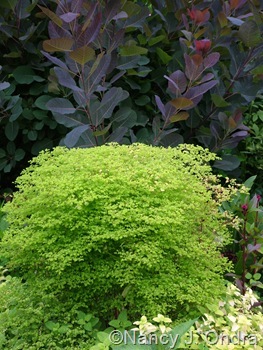 I like to buy shrubs that I can cut back as they add something special to the garden and grow so quickly. We have a Kilmarnock Willow (it was a present that I thought I wouldn’t like, luckily it has a 5ft trunk), after it outgrew its space we cut it back to the top of the grafted trunk in Autumn. It looks like a sculpture all winter with curly branches and then we enjoy watching it grow – the branches soon reach the ground. I am not sure how many years it will take this treatment but as it had 5 or more years to grow good roots I am hopeful. I have lots of spring flowers underneath which we can see without the branches and they enjoy the shade all summer. I love your photos! 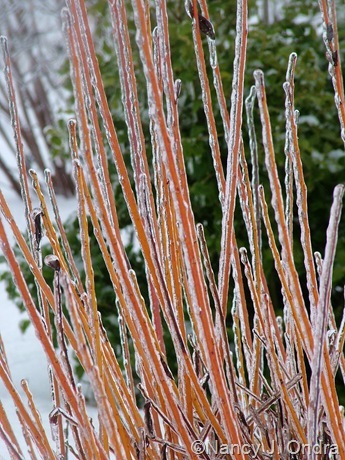 I like the idea of trying this with a variegated poplar, Sylvia! The willow sounds neat, too. It’s my understanding that willows generally tolerate coppicing with no problem, so I expect you’ll be able to enjoy yours for a very long time. This was an excellent and comprehensive post. 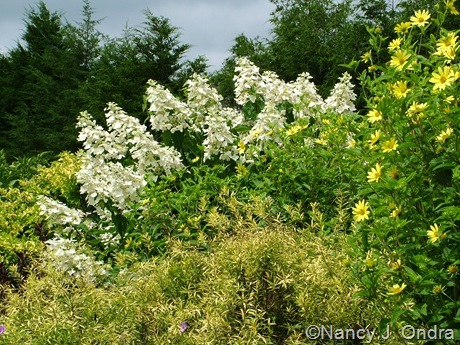 I use several cut back shrubs in my mixed borders here in NH. I was cleaning up the garden and coppicing some of the trees and shrubs yesterday. 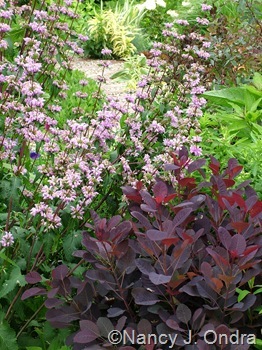 I have had good success in the last ten years with Catalpa bignonioides ‘Aurea’, Gleditsia ‘Ruby Lace’ and Cotinus coggygria ‘Royal Purple’. Like you, two different plants of S. racemosa ‘Sutherland Gold’ petered out after 4 or 5 years. The first three years it was spectacular and the last two it declined. I don’t think it is tough enough to handle coppicing over and over again. I suspect it may be a short-lived shrub even without coppicing. Thanks for an excellent post! It’s so interesting to hear that you had the same experience with ‘Sutherland Gold’, Michael. Maybe I will get another one to see how it would perform here over the long run without any pruning. The comment, above, about spireas reminded me of how mine get managed… eaten to the ground each winter by hares but the spireas don’t seem to mind a bit and come back every year! LOL! Deer are also good at coppicing, Janice, though they don’t do it very evenly. Most of the shrubs I have outside my fenced area have been cut back hard at one time or another, even if I didn’t want them to be! I am not a lazy pruner I am just a uninterested pruner for the most part, however after seeing your results I realize I would have some prettier shrubs if I would do this. I don’t have a big garden and I do have some rather large shrubs that need to be tamed. Thanks for your encouragement. I’ll be interested in hearing how it works out for you, Lisa. You may want to try just one this year to see how it goes. Doing a hard cut-back on a large shrub can be one of those “oh, no – why did I do that?” things, but once you get over the first trauma, watching the plant fill out again and look better than ever is a gratifying experience. Well, you’ve given me a lot to think about. I’ve never tried to coppice anything, instead I’ve used the thinning technique. Your results are so strong, I’m thinking I should give this a try, but I’ll probably end up doing a half coppice on one shrub to see if it works for me. I have a variegated red-twigged dogwood that might benefit from this. Definitely, give it a try on one this year. If it’s well established, 6 to 8 inches would probably be fine, but you could try 12 to 16 inches this time as an experiment. Great article and the detail you provide (especially the step by step pictures) is never too long for an inexperienced gardener like me. I learn a lot. 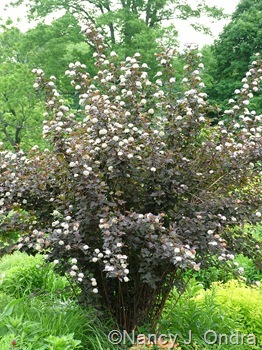 I have long wanted a ‘Grace’ smokebush for its foliage, but haven’t the room, and I’m not crazy about the puffy flowers. 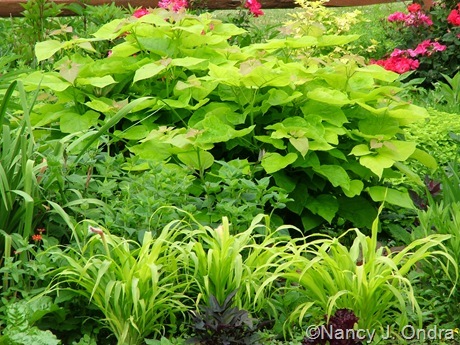 This article shows me how I can accommodate it… can’t wait to plant it now! I appreciate that feedback, Laurrie, and I’m glad you found the info helpful. You’ll love ‘Grace’: her color is a different each year, it seems, but she never disappoints. I come to expect gorgeous photos on your site, but it’s hard not to be blown away with your work. The breadth and detail is truly stunning. Often on garden blogs, I find hunger for more text, less photos, but in your case, the photos are the content, and work beautifully with the narrative you construct. I stare at each one intently. 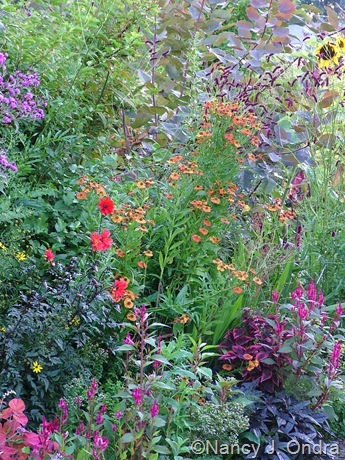 They are instructive both in terms of the craft of gardening and planting composition. This is one of the few sites I’ve come across I would pay to read. Kudos. I was also fascinated by your analysis of trends of the last few decades. I would love to know what other trends you think have come and gone in the last decade, and also what your opinion of what gardening is about (or should be about) now. 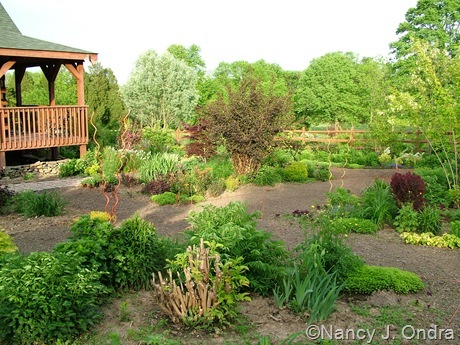 Blogging has turned out to be such a great format for sharing gardening information. I’d never be able to sell a piece like this; anymore, being allowed 1000 words for an article is a luxury, and I probably couldn’t get away with it in a book either. With 3000 words of text and all those photos, it would probably end up being 20 or 30 book pages. I’ve been trying to work on something I could self-publish based on a collection on my favorite posts, but it’s just not the same when I try to put them on a page. Anyway, thanks for the intriguing question about gardening trends. I’ll need to ruminate on that for a while, but at the moment, I think of them mainly from a plant, rather than a design, perspective. Herbs were really in when I started at Rodale in the early 90s, and I think it’s about time for renewed interest in them. (They’re my current passion again, anyway.) 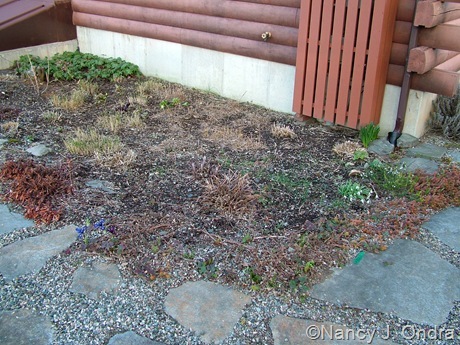 Then it was perennials in general, and then grasses, and natives, and succulents. The whole herbaceous border thing was “out” for a good while – gone with the days when people could afford a gardening staff to do the maintenance, don’t you know, and of such a limited peak season. So very impractical, we said; mixed borders are so much more sensible. 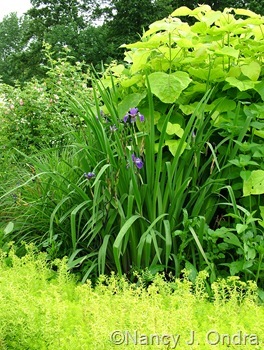 Then came grasses, and sturdy natives, and more access to late-season perennials in general, and we could create all-perennial borders that offered a long season of interest but didn’t need a lot of fussy maintenance to look good. I’m not interested in low-maintenance as a way to spend less time in the garden; I just want to do less of whatever I currently think of as being boring. I’m not going to say what I think the trends should be; anymore, I lean toward the “it’s all good” attitude. I’m kind of afraid to mock or declaim against anything anymore, because I’ve found myself doing lots of things that once made me cringe. Who knows – next year I may be shearing forsythias into cubes or filling my front garden with red geraniums and yellow marigolds (not that there’s anything wrong with that, Mom!). Any plants are better than no plants, and any (garden-related) obsession is better than no obsession at all. I love the way you give such comprehensive illustrations of your points, and demonstrate how to combine plants. 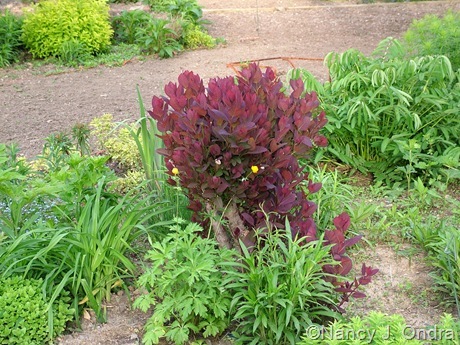 I use this technique on my Cercis canadensis ‘Forest Pansy’ to both contain its size and give me larger leaves, and it allows me to grow a beautiful plant that I don’t, strictly speaking, have room for. I also tried it on a Eucalyptus gunii to enjoy the lovely young leaves and use it as a graceful shrub rather than a tree. This worked fine until I managed to forget to cut it hard back two years in a row. It became a large and leaning tree that I needed a tree surgeon to remove for me! Oooh – somehow I haven’t yet gotten a ‘Forest Pansy’, but now I must so I can give that a try. I wish the eucalyptus was an option here too. Your experience with it is the same thing I worry about with the golden catalpa, and it’s why I’ve leaned toward the multiple prunings each year, even though I can tell it’s weakening the plant. For a while, it was so vigorous that I knew if I missed a year or two, I’d have a very hard time back in control. These are great ideas. I wish I had known more about cutting back trees years ago. I had a Geyer’s Willow (Salix geyeriana) that in retrospect would probably have done well and kept within some bounds if I had trimmed it like this. Alas, I lost it because it got to big for the space, and I now I can’t seem to find a specimen for sale. Last year, I was visiting a hosta garden, and I was baffled by a nice, small delightful plant I mistook for a perennial. After talking with the owner, I found out it was Deutzia ‘Chardonnay Pearls’–one of the most delightful uses of this technique I have ever seen. It seems like the possibilities for this are endless; requiring nothing but boldness and some good snippers. Of course I had to look up that willow, Dan. It does look like it would be worth trying to track down. I’m sorry that you lost yours. Thanks so much for the tip on the deutzia, too. I have a couple of Chardonnay Pearls that have been settled in but not doing much for the last few years. I think I’ll try cutting them back hard in the hopes that they’ll either look much better or else die so I can put something else in their space. You never cease to amaze me in your blog. Thank you for the absolutely fabulous information and inspiring photographs. Keep it coming, I appreciate every morsel of your tried insight! Thank *you* for reading, Susan! Oh, what a wonderful blast of colour and thoughts of spring and summer. Everything is covered by snow here again, but at least it won’t last long. It’s not been very spring-like here either, Lene, but at least we don’t still have snow cover. I think we’re all ready for spring to come and stay! You may be aware of ‘digital’ printing, specifically ‘short-run’ digital printing; printing a small quantity that would not be practical to produce by traditional ‘offset’ printing due to the cost. The responses you have received from this blog may indicate you have a paying audience for an ‘instructional show & tell gardening booklet.’ You have the expertise and images. You have a platform to solicit prepaid subscriptions, produce the number of booklets required and have them mailed. Your writing-publishing experience would suggest success. I would subscribe and I would love to help if you think this has merit. I really appreciate the advice and encouragement, John. You’re convinced me to seriously consider the options again. My mind is spinning with POD, EPUB, MOBI, and PDF. I’m hoping I can get it all straight and choose one to try. I’ll get in touch soon by e-mail, John. Full of great ideas, I may try this. I have been removing shrubs as they got too big, but trying this seems like an easier way. 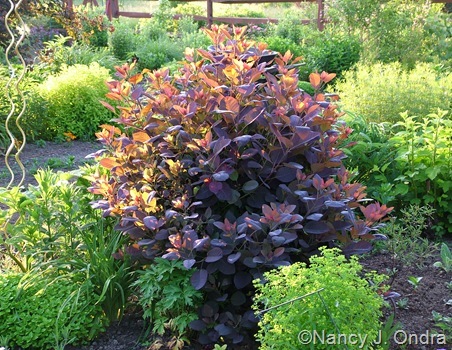 My dark smoke bush was seed grown and even after 6 years it has very dark foliage all season long, so I don’t feel the need to cut it to get dark foliage. But it is getting rather large . . .
Have you ever tried it on weigela? I have some outgrowing their space. Yep, I’ve had good results with it on the yellow-leaved Briant Rubidor and purple Wine and Roses. I had been thinning out a few of the older stems each year, but it just wasn’t keeping the shrubs well shaped, and they were getting too large. I sort of missed the flowers that year, but it was worth it: the foliage and form looked much better and they started flowering again the following year. I wouldn’t try it every year, but maybe every 3 to 5 years, depending on how vigorously they recover. A wonderful discussion of coppicing! 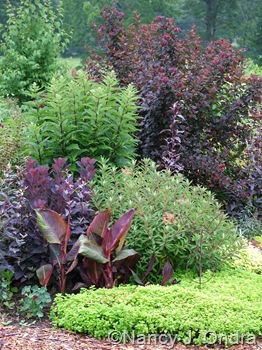 We talk with our clients each year about cutting their shrubs back hard, but it is always a tough sell. I’ll have to direct them to your blog in the future. Your post may have run longer than you expected, and I generally just skim long posts, but found I was reading every word (as I usually do here), completely lost in the photos and tips, and enjoyed every minute! Thanks, Scott! I think seeing the progression of how a shrub recovers from coppicing adds a level of comfort to trying the technique. Even after trying it on many different shrubs for years, it still amazes me that what seems to be drastic butchering ends up producing such great results. 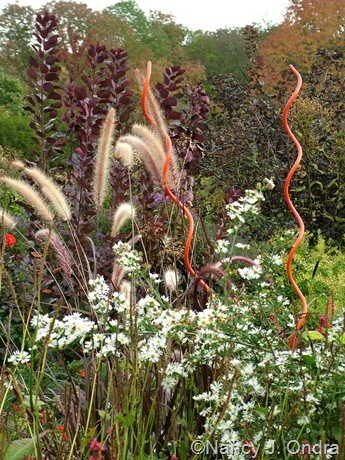 Micheal King at http://www.perennialmeadows.com has just published some ebooks. Thought you may like to visit, his blog is interesting too. Hi Nan! 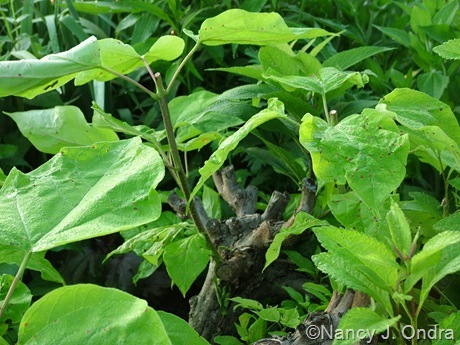 Thanks so much for your schedule for coppicing Golden catalpa (Catalpa bignonioides ‘Aurea’). Mine came with us from Pennsylvania to Maryland when we moved a few years, and it survived (I should probably say thrived here!) in a holding bed during all the house-moving upheaval. Anyway, I’m designing a planting bed around where it rooted. I haven’t always managed to get it cut back, but am planning on a double attack as you suggested in your post. I wondered if you ever cut below the main framework. A couple of the main branches on mine had a really thick accumulation of stubs, and I cut just below these this spring. Hey, Barbara! Good thinking, planning a bed around where the catalpa rooted instead of trying to move it. Yes, removing the knob that forms after a couple of years of coppicing works fine. That’s another advantage of starting with a higher framework, so you can cut lower every once in a while if you need or want to. I’ll also mention that you can reverse that and create a higher framework on a plant that’s previously been coppiced close to the ground: Leave three or four of the sturdiest shoots from the previous year, cut all the rest back as close to the ground as possible, and then prune the remaining shoots around the height you want the framework to be. When the new growth pushes out, remove all of the new shoots except for those growing out near the tips of the framework. It’s easiest to do this when the new growth is about an inch or less, because you can break or even just rub off the tender shoots with your fingers. When they get longer and tougher, then you need to snip them them all off with shears. I knew that you were supposed to cut back smokebush, but I hadn’t had the courage. Now that I have seen your step-by-step photos, I am going to do it. Thank you so much. Great! I think you’ll be really pleased with the results, Carolyn. As a bonsai grower I have always been cutting and pruning my trees and shrubs earlier, but since we moved here in 2003 I´m just waiting for my new garden to mature first. Finally the “inner part” around the house have done that and I can start remodelling it. And you gave me some new tips which I will use this year. But we are having a terrible winter which still are here, so I have to wait a week or two. But then…..
That’ll be a good time to get out and start pruning, Susie. I hope it warms up for you soon. Nan…what a wonderful and timely topic! I will refer to this often, I can tell! 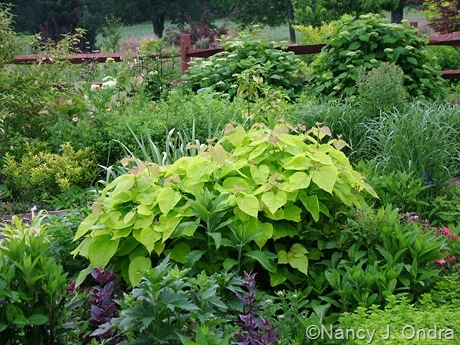 I’m glad to see someone so esteemed acknowledge the trickiness of integrating shrubs into a border…something I’ve been trying to figure out for a while! My backyard is very small (10×20 I think) and even though everyone tells me (and as I’ve read in every book and magazine) I should have some “bones” but I can’t for the life of me figure out how to do it without sacrificing too much space! Coppicing seemed to be the answer. 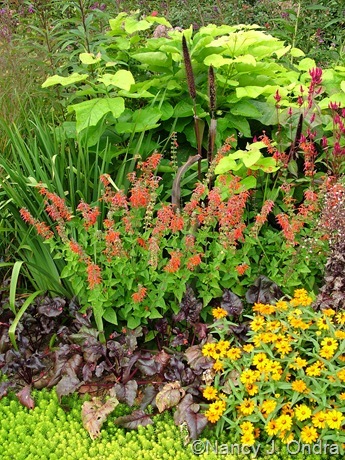 Keeping the herbaceous plants from overwhelming the shrub, then vice-versa does seem a tricky balancing act. I guess I just need to screw my courage to the sticking place! 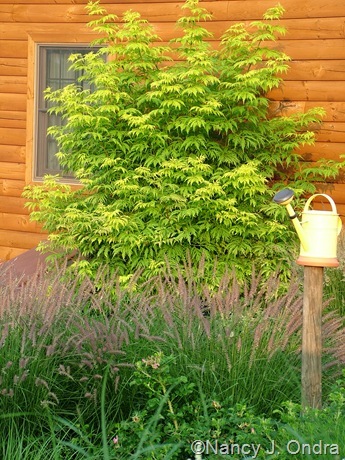 If you had to recommend one shrub for a smallish garden…what would it be? You know, Scott, I’m starting to have nightmares about people whacking back their shrubs and then sending me hate mail because their plants die or don’t respond as mine have. If you try it, I hope you’re pleased with the results! 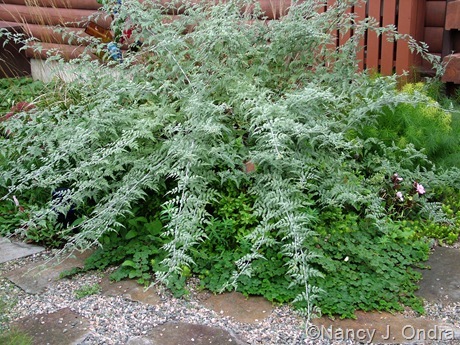 In regards to a shrub for a smallish garden…how much sun? Any preference or dislikes in regards to foliage color? I am SO glad you mentioned this works well Forsythia ‘Kumson’. I planted some and was sort of waiting for the punchline. Some of the new leaves looked great, but they faded fast! I love Buddleia ‘Black Knight’ and Caryopteris as cutbacks. Took me a while to catch on with ‘Kumson’, Andrew. It was kind of an accident that I cut it back in the first place, but when I saw the results, I was very impressed with the persistence of the foliage markings. Thanks for recommending other good candidates for the technique. I was out pruning yesterday and realized that I could have shown many more: lavenders, Diervilla, Elsholtzia, Knock Out roses (rugosas and Rosa glauca, as well), Callicarpa ‘Issai’, and Lonicera nitida too. Even better, after I wrote this, I looked out the window at a little Weigela I moved last year and thought “Hmmm… I’ll have to ask Nan about that.” — so I was thrilled to find in the comments that you’ve had a good luck with that one too! I’m going out with my pruners as soon as I’m done with this. Thanks again! Um…I might have suggested giving it a second year to get re-established before a hard pruning. But I bet it will be ok this year, and it will probably look much better next year. Good luck! I am honored to have been spotted by you – I hope you enjoy the eBooks when the garden gives you the time to do some reading. I love this post and although as Thomas says your photographs are wonderful some of them do convince me that hacking into shrubs robs them of their grace and can lead to an ugly skeleton to look at for far too long before the new growth redeems the situation. I have fought with shrubs, including roses, in my borders for years and finally decided they don’t work for me. Of course I make exceptions, but know that each one brings extra work and possible long term problems. I wrote a short (in your terms) post about this recently which you might like to look at. Hi Michael! I already am enjoying your Introduction – Perennial Meadows book, and your blog too. What you’re writing really speaks to my current interests. I completely agree with you that repeated hard pruning changes the whole character of a shrub, especially its winter appearance. I’m normally a fan of choosing the right plant for a spot instead of trying to keep a big plant small. 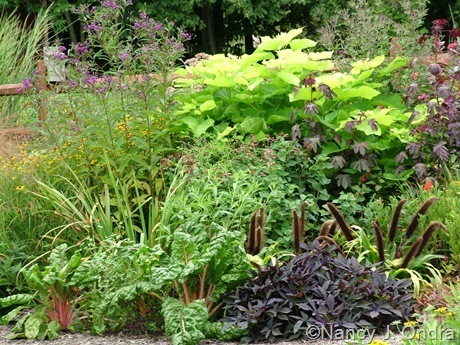 But I also have fun creating combinations, so I’m not above using hard pruning to get a certain height or foliage effect that I can’t get with a perennial. Adding to the chorus on the wonderful post. I have a question too. What is that lovely lime green feathery thing in front of Grace on one of your photos? That’s Euphorbia ‘Golden Foam’ – sometimes sold as E. stricta ‘Golden Foam’. Mine is from seed from Plant World. It acts like an annual or biennial for me in mid-Zone 6. Kids still asleep, coffee in hand and this incredibly informative post in hand leads to the perfect Sunday morning! 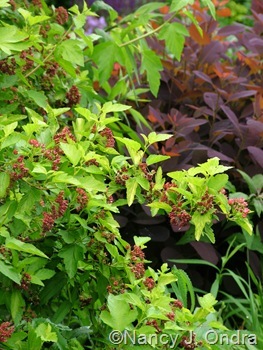 I am on year 3-4 for many of these shrubs (like ninebark ‘summer wine’ and ‘diablo’) and have been contemplating a hard pruning. I think I’ll cut back some and leave others just to compare the differences. I have no problem sacrificing flowers for better foliage and I am now inspired to whack away (within reason of course). 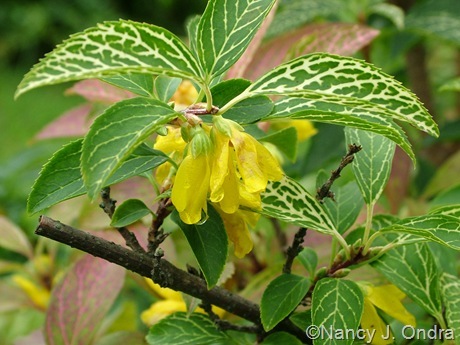 I have a few Weigela ‘Wine and Roses’ that I have been bored with the past two years and am hoping that a severe pruning this spring will result in better foliage. Thank you again for all of the info and incredible photos to go with it. This is a perfect time of year to try the technique, John. I’m doing the bulk of my pruning projects this weekend. If you have of each shrub, you could try coppicing on one, no pruning on one, and thinning cuts (a nice compromise between the two extremes) on another. Don’t forget to take before and after pictures, too. I took the plunge and butchered away, I mean pruned two of my three Weigela ‘wine and roses’. One was cut down to about a foot, one was more selectively pruned and one was left alone. I just wrote a blog post about it. Thanks for the inspiration! Fantastic, John! Thanks for contributing to the topic. Here’s a direct link to your post: Experimental Pruning. Now, to await the results…. I hope John does that and posts the pictures here! After reading this wonderful post and seeing all of your great photos, I have decided to keep the dogwoods on a thinning technique. That knob of foliage below the long shoots would bug me, I think, in winter. I’m going to try it on the dappled willow, I don’t care what happens, so I won’t (and don’t you) lose any sleep over it! Whew! One less plant to worry about. But you know, with that kind of attitude, you’re guaranteeing that it will live. It’s only the ones you really care about or spent a fortune for that die so easily. And definitely, keep on going with what works best on your dogwoods. Sometimes it takes seeing other options to boost your confidence that you’ve found the best technique for your own garden. Nan~You always inspire me, both as a writer and a gardener. It does boost my confidence to read that you struggle with some of the same challenges. 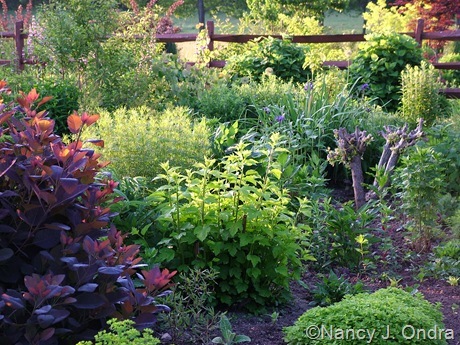 I have a deep, abiding affection for shrubs (and grasses) and have a hard time limiting them to backgrounds and accents, but that is where they do best (for me, in my limited space) mixed with perennials in my backyard gardens. The front garden is just the opposite, where the perennials are meant to accent the shrubs; otherwise there would be nothing to look at for six months of the year! 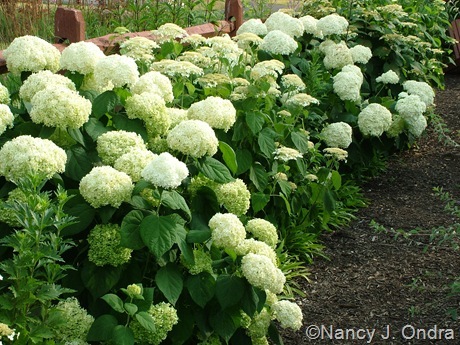 I also forgot to say THANK YOU for the great comparison pics of the panicle hydrangeas!! I might use them for a background hedge to my knockout roses in the front. 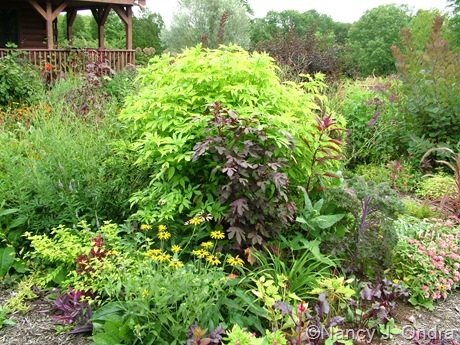 I would love to get more of your input on mixed shrub design. Oh yeah – I’m pretty sure I’ve killed way more plants over the years than I’ve had luck with, though my odds of success are improving these days, maybe because I’m sticking closer to the plants I know better. I do enjoying using shrubs too, and I can’t imagine giving up any of those that I already have. I just added a few more, too. 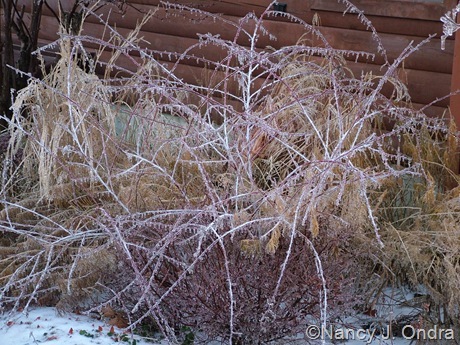 A post on combinations that include shrubs is a great idea – thanks! You’re welcome. I can’t wait!